Tongji Dian Racing from Tongji University performed well in last year’s Formula Student China ranking 4th. Kvaser’s CAN/CAN FD data-logger was part of it. 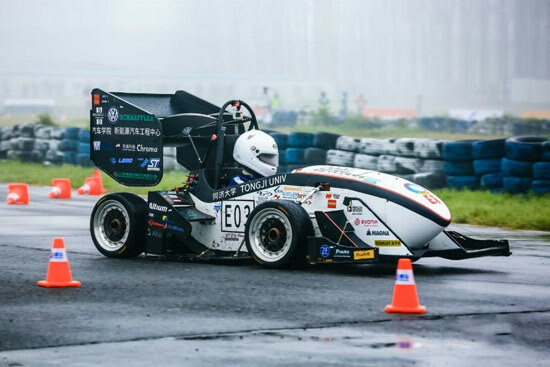 As an international racing team, Tongji Dian Racing Team designs and manufactures an electric formula car each year, and achieves various results in all major electric Formula Student events around the world. In October 2018, the next Formula Student China takes place. Last season’s car, the DRe17 – had undergone a significant change in technology and appearance. This included the use of four electric motors, a third spring, a self-built battery management system, and other technologies to bring new ideas into the domestic electric car design. The stable performance of the racing team is based on test runs and requirements on the different specifications and values, such as including data capture for analysis using Kvaser’s Memorator Pro 2xHS v2 interface and data-logger. It allows users to monitor and log data from two Classical CAN or CAN FD channels using one device. Additionally it is compatible with J1939, CANopen, NMEA 2000, and Devicenet. The data-loggers can gather parameters such as battery usage, cooling pack temperature, lean angles, suspension data, wheel speed, torque, acceleration, and braking. Besides Dian Racing, Kvaser has sponsored racing teams from all over the world.